Alfa Romeo previewed a new crossover when it revealed the Tonale concept at the 2019 Geneva Motor Show earlier this month. But as is often the case, what we really want is to see it in performance spec. 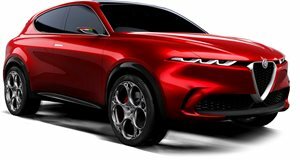 Fortunately the prolific artist Nikita Aksyonov has given us a pretty good idea of what a Tonale Quadrifoglio would look like in this pair of speculative renderings, applying to the concept some of the same visual enhancements we've seen on the Quadrifoglio versions of the larger Stelvio crossover and Giulia sedan. And to our eyes, it looks pretty hot. Envisioned as a smaller counterpart to the Stelvio, the Tonale concept similarly draws its name from an Alpine mountain pass. It's said to be based on the same FCA Small Wide 4x4 platform as the Jeep Renegade and Fiat 500X – subcompact crossover SUVs that the Italian-American automaker produces along the same line at its plant in Melfi, down in the south of the boot-shaped country. The Tonale is expected to enter production (and Alfa Romeo's lineup) sometime next year, but there's still a great deal we don't know about it – including powertrain specifications. The likely scenario would have Alfa using some of the same engines that power the Renegade and 500X, which employ a range of three- and four-cylinder gasoline and diesel engines. 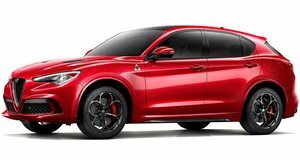 Given the twin-turbo V6 powering the Giulia and Stelvio Quadrifoglios, we might anticipate a potential performance version of the Tonale to pack a turbo four. If such a model were indeed approved for production, it'd give FCA a suitable foil to the likes of the Nissan Juke Nismo and Mini John Cooper Works Countryman. Here's hoping the strategists in Turin and Detroit see that as a niche worth pursuing.